There’s quite a lot of new music I’m recommending in this Sunday’s column — three full EP streams (one of which is an EP-length single composition), plus advance tracks from three forthcoming albums. Coincidentally, four of the featured bands are essentially solo projects. As usual, I picked these selections in part to provide some listening variety, though there’s certainly more than a fair share of melancholy and grandeur to be found herein, along with a fair share of ripping and tearing. I also positioned one selection to provide a bit of a diversionary interlude through its interweaving of Neo-Folk elements (and clean singing) among heavier sounds. 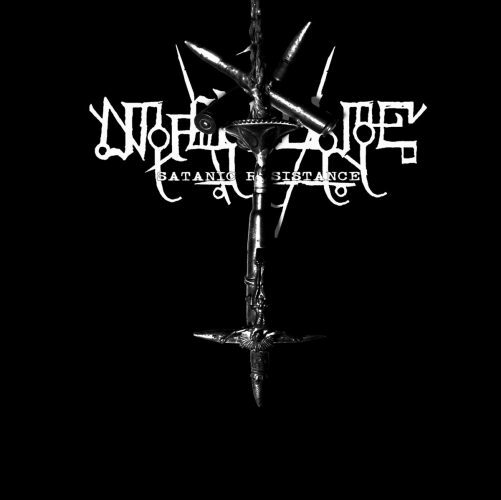 I discovered this Austrian atmospheric/post-black metal band through a 2016 video of the title track from their 2014 EP, Weltennacht. I couldn’t get the song out of my head, and the video was hard to forget, too, since it included film of the 1987 public suicide of a Pennsylvania politician (Budd Dwyer) at a press conference he conducted the day before he was to be sentenced to prison following a conviction for bribery. With such a memorable introduction, I didn’t need to be convinced that the band’s next release, their late-2016 album Todbringer (“death-bringer”), would be worth exploring. It was heavy, anguished, and glorious (and inspired other emotions, but those are the ones that come to mind first in thinking back on that entrancing experience), with a song-writing approach that included instruments other than the usual heavy-metal weaponry. 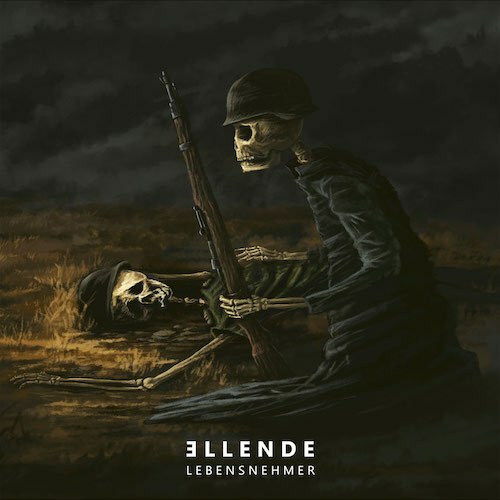 Now Ellende‘s third album, Lebensnehmer (“life-taker”), is on the way, with a March 29 release date set by AOP Records. It is again the work of multi-instrumentalist/vocalist L.G., with drumming by P.F., who is a member of the band’s live line-up. The first song to be revealed from the album, “Du wärst eine schöne Leiche“, blazes and blinds the eyes, like a sunrise happening at the speed of a jet. The gleaming melodies burst with an emotional intensity that’s both ravaging and glorious (there’s that word again), with passages of striking sadness and haunting beauty mingled amidst surges of fiery extravagance. L.G.‘s vocals are also fiery, and tremendously furious, while P.F.‘s nuanced drumwork is fantastic. It’s such a wonderfully multi-faceted song, one that’s as persistently entrancing as it is explosive. I feel like the entire album is burning a hole in my computer — I’d better hurry and listen to the rest of it before it bursts the bounds of the circuity and rockets into the sky, where it probably belongs. AOP will release the album on CD, LP vinyl, and a box-set edition (the latter two formats will include a bonus track), as well as digitally. As with Ellende, I’ve had a memorable past encounter with the Andalusian band Meszaroth, through their 2017 debut EP Nihil Manifesto (enthusiastically reviewed here). Their follow-up EP leaves me at least equally enthusiastic. 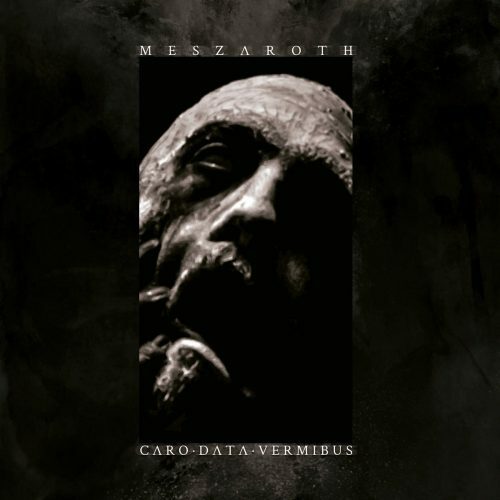 Caro Data Vermibus is a four-track, 30-minute offering, that was digitally released on January 31st. What will strike you immediately is how heavy and harrowing the music is, almost oppressively gloomy and mind-warping, with vocals of such shivering intensity that they strain the bonds of sanity, yet which also become almost reverentially solemn (and drop low enough to resemble throat-singing). In the opening track, “Ascension”, the ringing melodies have a very eerie and otherworldly aspect, fantastical in their impact yet with a degree of dissonance that creates a deep sense of unease, and they become feverishly unhinged when the propulsion is blasting at high velocity. The atmosphere is a gripping combination of paranormal panoramic sweep and inner personal turmoil, as the music dramatically swings in its energy. If you’re not thoroughly captivated by the unsettling moods of “Ascension”, the remaining three tracks should do the job. They’re just as powerfully produced and irresistibly penetrating — and just as likely to leave you at an emotional intersection between depression, anxiety, pain, and exultation. You’ll also encounter a wide range of vocal expressions, which include bestial growls and leonine howls, wrenching yells and grim spoken words. There’s no shortage of passion in these songs. The entire EP is one of those great immersive experiences that seems both larger than life in the grandeur of its scale, estranged from the mundane, and yet all too familiar in its resonances of frustrated striving and hopelessness. Vielikan is a name you might have seen at NCS before. It’s the solo project of Tunisia-based musician Fedor Souissi Kovalevsky. At the end of 2016, I wrote about a single (with a video) named “Everlasting Smile”, and then another single and video in 2017 called “Voskresenie“. A couple of other singles were released in the years after the band’s debut album A Trapped Way For Wisdom (2010), and then I also had a some very positive things to say about the first advance track from Vielikan‘s new album, Back To the Black Marsh, which will be released on March 9th of this year (and which is available on Bandcamp here). The music of Vielikan could be characterized as progressive death metal that also draws upon black metal. But Fedor Kovalevsky has another musical vehicle besides Vielikan, and that one is named Omination, whose music could be thought of as “apocalyptic funeral doom” — though in spirit, if not entirely in sound, I don’t think I’m stretching the format of this column too far by including Omination here. In 2018, Omination released an gigantic debut double-album, Followers of the Apocalypse, which I failed to check out. 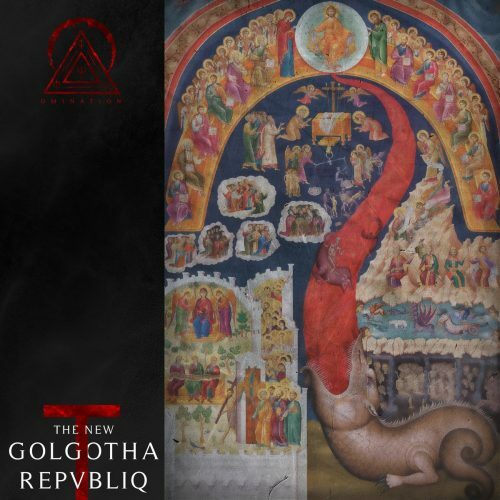 More recently — in fact, just two days ago — Omination released a new 20-minute single named The New Golgotha Repvbliq, which is the eponymous track from a new album to be released later this year on Hypnotic Dirge Records. Attempting to sum up these 20 minutes (and summing up is usually all I have time to do in these columns) is a serious challenge. Unlike much of what passes for funeral doom, the emotional intensity of the music is explosive, which is why the adjective “apocalyptic” rings true. The vocals alone are shattering enough to make you jump out of your skin, ranging from harrowing growls to mind-melting yells and shrieks, and deep, chant-like singing that conveys a sense of mystical devotion. The pacing, as you might expect, is generally deliberate, but even over 20 minutes the music doesn’t drag. It’s so overpoweringly heavy and all-enveloping, and the morphing riffs and guitar accents so dramatic (and disorienting) that drifting away isn’t a risk. The melodies have an exotic aspect, with whiffs of the occult in their aroma as well as strains of North African music that create visions (at least for me) of vast, ancient deserts in which magnificent desolation merges with orphic mirages. Grand organ chords one moment, ethereal guitar notes the next, the crash and sweep of bleak riffing combined with titanic drum-and-bass performances the next… the changes persist, climbing to a plateau of pulsating percussion and a wailing guitar solo that itself spins up to a dervish-like whirl of devastating emotional splintering. Everything seems to come apart at the seams after that… and what’s left at the end is an instrumental performance that’s slow again, and utterly spell-binding, eventually joined by a final reverential chant and one last display of grim magnificence. Set aside 20 minutes and steep your mind in this track. You can also watch a short and prayerful trailer for the single here. Of course, anyone who decides in 2019 to launch a new label devoted to underground extreme metal needs to have their head examined; the ratio of work to reward is just too daunting (though of course there is usually, at least for a brief time, the reward of believing you have done something good for at least an infinitesimally small fraction of the world’s people). But don’t tell that to the man who has just started Brucia Records in Italy; most of us in that tiny fraction thrive on the lunacy of such people. 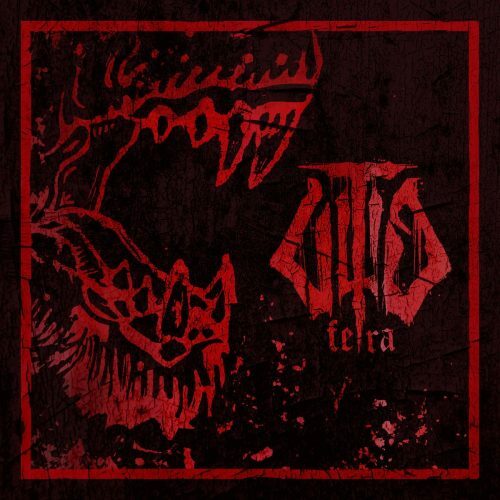 There is also abundant, and perhaps lunatic, passion that comes through in the music of the black metal solo project Ultio, whose tremendous debut EP Fera is the first release of Brucia Records. Fera was released as a demo last April, and will be provided by the new label on March 17th in remastered form on digipack CDr, and digitally. The identity and location of the person behind Ultio have not been disclosed, so all we have for now is the music… which is more than enough to leave a person aghast. “Beasts” thunders with the sound of rampant blasting drums, and over that maniacal drive the cascading music builds a sense of tension and peril, while the snarling and shrieking vocals themselves channel the name of the song. This is undeniably dramatic music, with a sense of grandeur in the soaring sweep of the music, but it’s unmistakably dark and poisonous, too, with an air of derangement in the flickering leads. That combination of wide-screen drama, ominous peril, oppressive gloom, and fracturing sanity is to be found again in “Ablaze”, which (as its name suggests) also ascends to new heights of extravagant, whirling zealotry, carrying the listener aloft in a cyclonic pillar of fire. You might need a breather after “Ablaze”, but while “Beyond the Fog” is generally (but not entirely) less explosive, it’s no less intense in its channeling of tension, misery, and despair. In fact, both that track and the last one (“The Right Weapon”), which is more unhinged and grandiose, are cut from the same cloth as the first two songs. It’s a good thing there are only four songs on the EP — their emotionally fracturing intensity left me wrung out, but still marveling. Now it’s time for that diversionary interlude I mentioned at the outset, which after that last EP probably can’t come soon enough. It consists of songs from Lunar Falls, the debut album of a one-woman Australian project named Suldusk. That album will be released on April 12th by Northern Silence, which describes the music as an interweaving of “the acoustic tones of Dark/Neo Folk with elements of Post Rock and Atmospheric Black Metal to create a powerful panorama of shimmering guitars, haunting melodies and atmospheric density”. 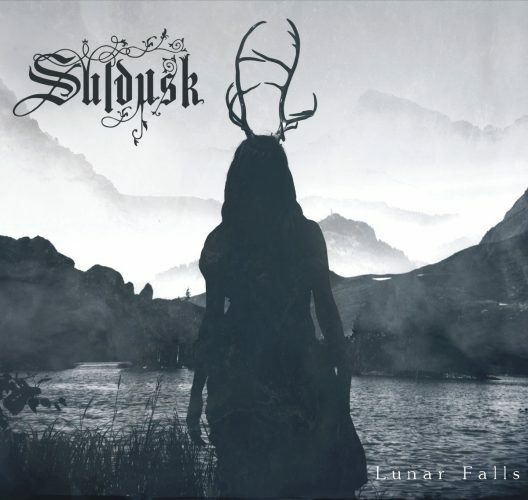 As demonstrated in the three tracks that are now available on Bandcamp, Emily Highfield, the sole creator of Suldusk, has succeeded in creating thoroughly entrancing musical experiences through seamless juxtapositions of contrasting musical styles. Even her vocals are representative of those contrasts — both caustic in their acidity and beautifully ethereal in their clarity. The music ranges from beguiling acoustic picking — meditative, moody, and also bright and beautiful — to bracing, bounding, head-nodding romps and haunting dreams. There’s a soaring and sweeping quality to some of these passages as well, complementing the poignant fragility of other moments. With that beautiful interlude behind us, I’m going to close today’s column with music from Satanic Resistance, the new album by the scorching French black metal band Malhkebre, which will be released on February 25th by Lamech Records (in LP, CD, and digital formats). This is Malhkebre‘s second album, but my first exposure to their sounds. 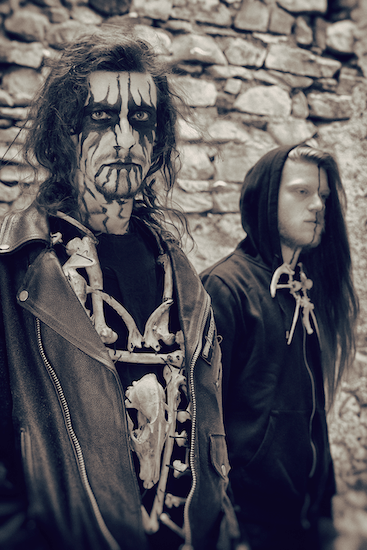 The band’s line-up includes members of Decline of the I, The Order of Apollyon, Malekhamoves, and Sektarism. For now, that first exposure consists of just the two songs now streaming on Bandcamp, “L’Appel” and “Veni, Vidi, Vici”. I thought these would provide a good change from… well… just about everything else that’s come before in today’s column. “L’Appel” is packed with physical thrust and punch, delivering a display of blood-pumping carnality and demonic hostility, mixed with rippling leads that are sulphurous, and eerie. As you’ll discover, it’s a tempo-dynamic track that becomes hallucinatory when the pacing slows to a lurching momentum, providing a good complement to the arrogant, muscled swagger of the faster segments. The band’s knack for creating a dynamic experience is further revealed in “Veni, Vidi, Vici”, which revels in misery and despair through a mid-paced stomp, its expression of oppressive gloom laced with frenzied leads that bespeak boiling madness. I wonder what else they do on this album? These two infernal tracks justify further exploration, don’t you think? Obviously, I thought these observations apply as accurately to metal blogdom as to everything else to be found on the internet. They also apply to music, of course. In the modern age, even extreme metal is both a smorgasbord and a junkyard. And even though it’s now easier than ever to listen before you buy, it seems there’s an even greater value provided by good filters. Hopefully, in our recommendations, we’re one of those valuable filters rather than just more detritus in the junkyard. The desire to be one of those useful guides to the tastier morsels on the smorgasbord is a big reason why we keep going, both in this column and in everything else we do across the other six days of each week. With that, until tomorrow, I bid you adios, motherfuckers. All great picks, I especially enjoyed Ellende, Omination and Suldusk. Warmoon Lord – old school BM album by the guy who also does Dungeon Synth as Okd Sorcery. To Conceal the Horns – BM by a guy who seems to have some ties to Alghazanth (Thasmorg does guest vocals on a song). He’s released an EP in January and a 19 minute song in February. Onfodt – Norwegian name, but find playing like 90s Norwegians. The Vehemence you recently wrote about is a good find, thanks for that and the ones above here. It was supposed to say “Finns playing like 90s Norwegians. ” I’m too clumsy to type well on my phone. Regarding that last paragraph: you are the best music blog out there for anyone interested in black/death metal, I will say it again. I wouldn’t be listening to some of the great records currently spinning at my place. And it’s all thanks to you sharing these albums, making me discovering these great bands, however obscure they may be. Be proud of your work. I salute and thank you!